Annuals; densely hirsute. Stems simple from base, erect, unbranched or branched distally, (0.8-)1.2-5(-6.3) dm. Basal leaves rosulate; petiole (0.5-) 1.5-6 cm; blade oblanceolate or oblong, (1-)2-6(-8) cm × 5-15 mm, margins entire, lyrate, or pinnatifid. Cauline leaves sessile; oblong, lanceolate, or narrowly deltate-lanceolate, (0.7-)1-4(-6.5) cm × (2-)5-10(-15) mm, base sagittate or auriculate, margins dentate or subentire. Racemes much-elongated in fruit; rachis hirsute, trichomes spreading, straight. Fruiting pedicels horizontal, straight or slightly recurved, (terete), (3-)4-8(-10) × 0.3-0.4 mm, hirsute. Flowers: sepals oblong, (1-)1.3-1.8 × 0.6-0.8 mm; petals white, spatulate, (1.5-)1.8-2.5(-3) × (0.2-)0.5-0.7 mm, claw 0.6-1 mm; stamens 6; filaments (1.2-)1.5-1.8(-2) mm, (glabrous); anthers 0.3-0.5 mm. Fruits broadly oblong to ovate, (4-)5-6(-6.5) × (3-)4-5 mm, (curved adaxially), apically broadly winged, apical notch (0.2-)0.4-0.6 mm deep; valves thin, papillate except for wing, not veined; style 0.2-0.5(-0.7) mm, slightly exserted beyond, or included in, apical notch. Seeds (dark brown), ovoid, 2-2.3(-2.8) × 1-1.4 mm. 2n = 16. Flowering May-Jun. Roadside, pastures, gardens, open flats, pine woodlands, rocky slopes, forests, waste grounds, disturbed areas, meadows, fields; 0-2600 m; introduced; B.C., Nfld. and Labr. (Nfld. ), N.S., Ont., P.E.I., Que., Sask. ; Ala., Ark., Calif., Colo., Conn., Del., D.C., Fla., Ga., Idaho, Ill., Ind., Iowa, Kans., Ky., La., Maine, Md., Mass., Mich., Miss., Mo., Mont., Nebr., Nev., N.H., N.J., N.Mex., N.Y., N.C., Ohio, Oreg., Pa., R.I., S.C., Tenn., Utah, Vt., Va., Wash., W.Va., Wis., Wyo. ; Europe; Asia; introduced also in South America, South Africa. 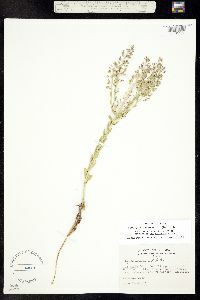 Annual or biennial herb with a taproot 20 cm - 0.5 m tall Flowers: in dense, branched clusters (raceme), which are borne terminally on the stems. Racemes to 15 cm long and densely short-haired. Petals four, white, 2 - 2.5 mm long, spatula-shaped, bases narrowed. Stamens six. Anthers yellow. Fruit: a pod (silicle), 5 - 6 mm long, oblong- egg-shaped, flattened, tips notched, broadly winged above. Seed one per chamber. Stems: multiple from base, upright to ascending, branched above, densely short-haired. Basal leaves: stalked, elongated, reverse lance-shaped, sometimes shallowly lobed, densely short-haired. Stem leaves: alternate, upright or ascending, usually clasping, stalkless, 2 - 4 cm long, lance-shaped to narrowly oblong, bases lobed, tips pointed, sometimes shallowly toothed, densely short-haired. Similar species: Lepidium campestre is the only Lepidium species that is densely hairy throughout and has lobed, clasping leaves. Lepidium perfoliatum also has lobed, clasping leaves, but it is not densely hairy throughout. Habitat and ecology: Introduced from Europe. A common weed of untilled farmland and pastures. Also found in grassy areas, railroad ballast, and waste places. Etymology: Lepidium comes from the Greek word lepis, meaning scale, which refers to the shape of the silicles. Campestre means "of the fields or plains." 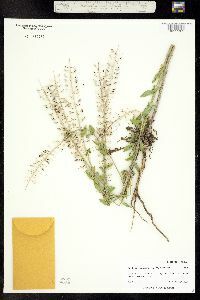 An infrequent to common or even abundant weed throughout the state. Our first report of it is dated in 1888. During the World War grass seed from Europe was freely sown when our pure seed law was not operative, and I think this fact accounts for its sudden appearance in such abundance. Grazing animals avoid it. I have seen clover fields of 5-10 acres that were almost pure stands of this species. Densely short-hairy annual or biennial 2-5 dm; basal lvs elongate, oblanceolate, entire to shallowly lobed; cauline lvs erect or ascending, lanceolate to narrowly oblong, 2-4 cm, entire or denticulate, sessile, clasping by acute auricles; racemes dense, to 15 cm, the mature pedicels divergent, 4-8 mm; pet white, 2-2.5 mm; stamens 6; anthers yellow; frs oblong- ovate, 5-6 mm, broadly winged above, the short style barely or scarcely exsert; 2n=16. Native of Europe, established as a weed of fields, roadsides, and waste places through our range and westward. May, June.